Valentine’s Day is only a week away, so it’s high time the Madtini Labs intoxicologists get cracking on mixng up some delicious cocktails for that special day. 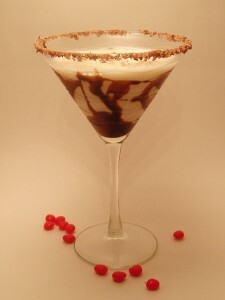 The Chocolate Swirl Martini is a hybrid of a several different vodka, chocolate cocktails. We couldn’t resist adding a chocolate shavings to the rim and creating swirls of chocolate inside the glass. Chill a cocktail glass in the freezer for 10 minutes. Remove the glass and create swirls inside the glass using chocolate syrup, return the glass to the freezer. Combine the vodka, creme de cacao and white chocolate liqueur in a cocktail shaker with 3 ice cubes. Shake well, add the half & half and stir. Remove the glass from the freezer, add a tablespoon of white chocolate liqueur to a shallow glass. Turn the glass in the liqueur, then turn it in the chocolate shavings. Replace the top of the shaker and strain into the chilled cocktail glass. Add a few pinches of chocolate shavings to the glass.